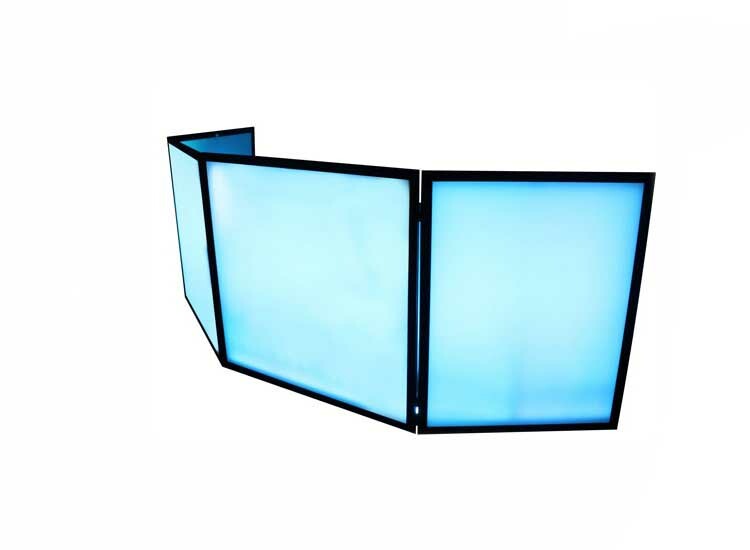 Today’s special event DJs continue to step-up their game with more elaborate clean setups and Scrim Werks™ facades are ideal accessories for these entertainers. The SWF9646B is one of four available sizes, each consisting of four detachable steel flag-hinged sections consisting of a super lightweight, black powder coated aluminum frame. Have a larger than usual setup? You can combine the center sections from multiple sets of the same height to create a wider façade if needed. The white dual layer scrim faces are fire retardant treated and can be used in conjunction with lighting effects* to create that perfect look for any momentous occasion. After the gig, if you find a stain on the scrim from an accidental drink spill or other mishap, no problem. All that is required is a screw driver to simply remove the scrim for cleaning**.